Nighttime light intensity across the United States. 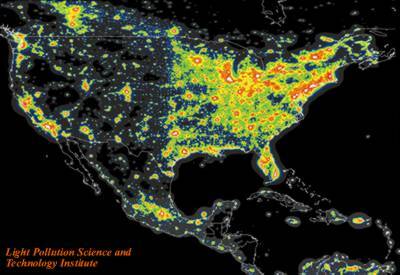 Light pollution has all but eradicated darkness from many parts of the country. The view from here is breathtaking. Through the rare air above the atmosphere, you can see the dark outlines of the landmasses, the paler waters of the oceans, and the edge of the world arcing by the stars of the Milky Way. Against this backdrop of midnight blue and black, clusters of diamonds spark and refract in delicate strands across a velvet horizon. Their light is a twinkling reminder of humanity’s presence in Europe, Japan, the East Coast, Los Angeles. This is nighttime Earth as seen from space. And while it makes for a lovely scene 830 kilometers away, artificial night lighting causes fundamental disruptions to animals who have come to depend on the darkness of night. Bulb by bulb, the invention made famous by Thomas Edison has come to usurp the moon and Milky Way as evening beacons. There is mounting evidence that the disappearance of darkness has far-ranging effects on birds and bats, frogs and fireflies, fish and zooplankton. And while research into the ecological effects of night lighting remains in its infancy, the accumulated evidence so far shows how deeply the constant aura surrounding human habitations affects night creatures. Since the time of the dinosaurs, squadrons of hatchling sea turtles have erupted from beaches and scrambled for the waterline. But today, instead of the foam of the sea, baby turtles head for road and resort lights as fast as their little flippers can carry them. Normally they are drawn by instinct toward low silhouettes. But the dazzling attraction of artificial light completely overrides their natural navigation systems. The lucky ones will change course toward the ocean once sunrise dampens the artificial glare. The unlucky will get crushed by oncoming cars or die from exhaustion or exposure. A similar attraction to light is driving endangered Hawaiian seabirds farther down the road to extinction. When Newell’s shearwater fledglings (Puffinus auricularis newelli) leave their coastal nests for the first time, they too travel toward the moon’s reflection on the water. But on nights when the bright lights of town outshine the moon, the disoriented fledglings often head inland, where they circle around until they drop exhausted from the sky. Biologists say lighting is partly to blame for the birds’ decline on the island of Kauai. Hundreds of thousands of songbirds die each year after becoming disoriented by bright lights. Many crash into tall towers and building windows. T he contrast of an electric bulb turns most deadly during the exaggerated darkness of storms. 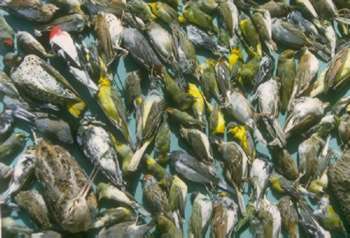 Migratory songbirds caught in bad weather die by the hundreds of thousands beside lighted communication towers and floodlit office buildings. “When the birds can’t see the stars, they must use their magnetic compass to navigate. Then they see this often bright light intensified by low cloud ceilings, and they seem to fly around towers in a tornado of birds,” says Albert Manville II, a biologist and bird strike expert with the United States Fish and Wildlife Service. Stories of mass bird kills at cell phone and television towers, and other tall structures abound. In 1998, 5,000 to 10,000 disoriented lapland longspurs flew themselves into the ground around one lit tower in Kansas. And in 1963, in Wisconsin, 12,000 birds died on a single night. Night lighting pressures animal populations in more subtle ways as well. Biologist Bryant Buchanan of Utica College at Syracuse University in New York found he could not study nocturnal frog behaviors while night games were played in the town football stadium. “Whenever lights illuminated the area, they stopped calling, they stopped reproducing,” Buchanan says. He thinks the frogs stay silent for fear of being spotted and snapped up by predators. Extra hours of daytime brightness could disrupt animal interactions by altering their natural schedules. Lighting might make salamanders more likely to see rivals, and therefore spend more time performing dominance displays. Constant posturing would cut into the time they would normally use to forage, according to research by biologist Sharon Wise of Utica College at Syracuse University. Even the habits of zooplankton—microscopic algae eaters that prevent ponds and lakes from scumming over—are thrown off-kilter by artificial lighting. Normally, water fleas such as Daphnia ascend the water column at night and sink back to the bottom by day. Marianne Moore and Sue Kohler of Wellesley College, Massachusetts, have found that light reduces the number of these zooplankton that migrate each evening, and keeps them several meters lower in the water column of freshwater lakes. “By keeping grazers down low, artificial light could indirectly promote algae blooms and make zooplankton easier prey for fish,” Moore says. Among the many species affected by artificial night lighting are a few that benefit from the perpetual twilight. Jens Rydell of the University of Göteborg, Sweden, and Hans J. Baagø of the Zoological Museum of Copenhagen, Denmark, have found that fast-flying bat species make a killing at streetlights that attract flitting halos of moths, while slow-flying species shun lights. Owls, foxes, and other predators whose hunting is aided by sight may thrive. Moth species that aren’t attracted to streetlights may outcompete those that tend to batter themselves against house windows and highway lamps. The good news is that, unlike habitat destruction, light pollution is one of the easiest environmental problems to correct. The most obvious method is through conservation: Turn off all unnecessary lights, and develop a lights-out policy for your office building, especially on stormy nights. Michael Mesure, founder of the Fatal Light Awareness Program, which works to eliminate bird kills in several cities, says that far fewer dead birds are found at city buildings that turn off their lights at night or during storms. Good shielding reduces the amount of light escaping into space and reflects more light into a useful, discrete pool on the ground. Such changes reduce confusion among navigating birds and keep baby sea turtles turned seaward. Mesure also reports that replacing the constant shine of many tower warning lights with blinking strobes drastically reduces the volume of bird kill. Experiments have shown that replacing streetlights with yellow, narrow-spectrum, low-pressure sodium bulbs may eliminate their attraction to many moths and other insects, according to Kenneth D. Frank, one of the first to address the topic in a seminal review of moths and night lighting in 1988. Lastly, using the least amount of outdoor lighting possible would prevent excess light from being generated in the first place. More people are now doing something about the problem. The California Coastal Commission has recently begun to consider the ecological effects of lighting on wildlife in its decisions, and included these concerns in its coastal plans for the city of Malibu. Perhaps one day the rest of us will be sufficiently enlightened to follow suit. Kathleen Wong is Senior Editor of California Wild.